We consider a game equilibrium in a network in each node of which an economy is described by the simple two-period model of endogenous growth with production and knowledge externalities. Each node of the network obtains an externality produced by the sum of knowledge in neighbor nodes. Uniqueness of the inner equilibrium is proved. Three ways of behavior of each agent are distinguished: active, passive, and hyperactive. Behavior of agents in dependence on received externalities is studied. It is shown that the equilibrium depends on the network structure. We study the role of passive agents and, in particular, possibilities of connection of components of active agents through components of passive agents. Changes of the equilibrium under changes in the network structure are studied. It is shown that appearance of a new link, as a rule, leads to decrease of knowledge in all nodes, but sometimes knowledge in some nodes increases. 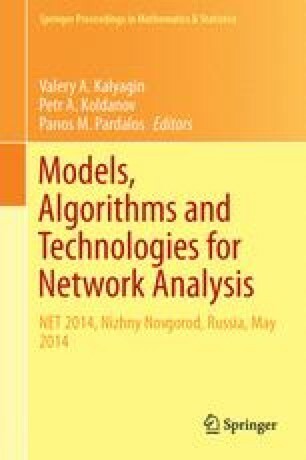 A notion of type of node is introduced and classification of networks based on this notion is provided. It is shown that the inner equilibrium depends not on the size of network but on its structure in terms of the types of nodes, and in similar networks of different size agents of the same type behave in similar way. The research was partially supported by Russian Foundation for Basic Research (projects 14-01-00448 and 14-06-00253).